This past week we’ve had very special guests staying with us. You’ve heard me mention over the years that when we did youth ministry we began going to serve with Churches in Mexico City every other summer. That committment continues, and our high school students return next year to serve again. Its been eleven years since the first time we took students, and this summer was the first time that some of our Mexican familia could come and visit us in Canada. It was very special and meaningful for us. There are some bonds that transcend culture and language, and we’re so grateful for them, their heart and warmth continues to amaze me. While they were here they asked if I was still making cards and I pulled out my “stuff” to show them what I do. I stamped this pretty bee balm flower from Power Poppy’s Vibrant Thanks set to show them, and then pulled out my markers and did a quick colouring job. It was so fun to show them something I love to do. This image does colour up really fast and within 10 minutes it was complete....so it was easy to put it into a card for today. 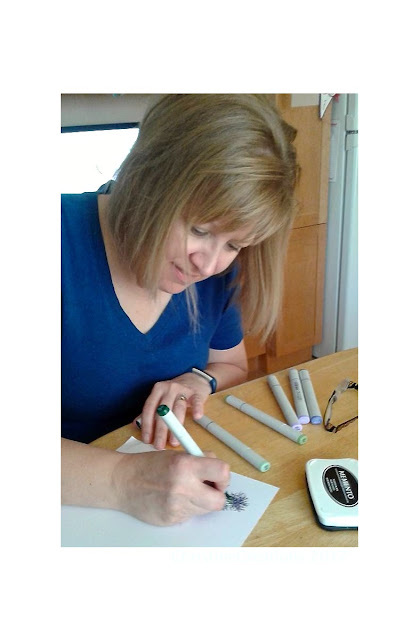 They took a picture of me colouring below, so I thought I’d borrow it to show you me in action. I added a scalloped frame behind the image, paired it with some pretty minty papers done in scallops, added some pretty soft green ribbon and then a few gems that take on the green, blue and purple in the design. You have a a couple more weeks left to join in our Mix and Match Challenge where you could win a $50 Power Poppy Shopping Spree, and there’s another fun Hues to Use Colour Challenge you can enter too - you could be featured on the Power Poppy blog. 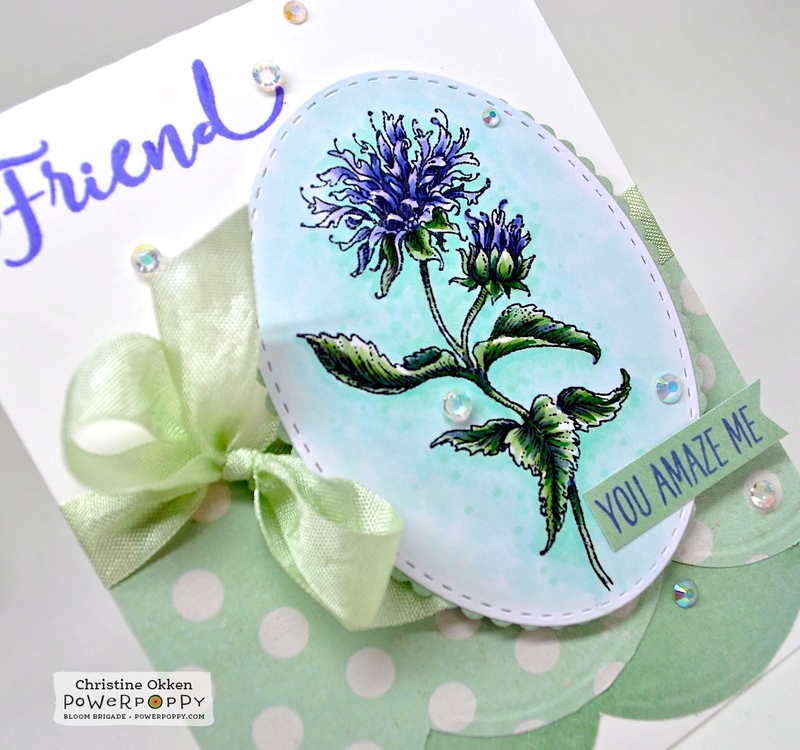 Pop by my Bloomie sister Stacy for some more lovely inspiration today too! Beautiful job for 10 minutes, you are going to find that they will be making cards one of these times you go down there! I imagine they're fascinated by the process, and just look what you colored in only 10 minutes! You're truly an expert. 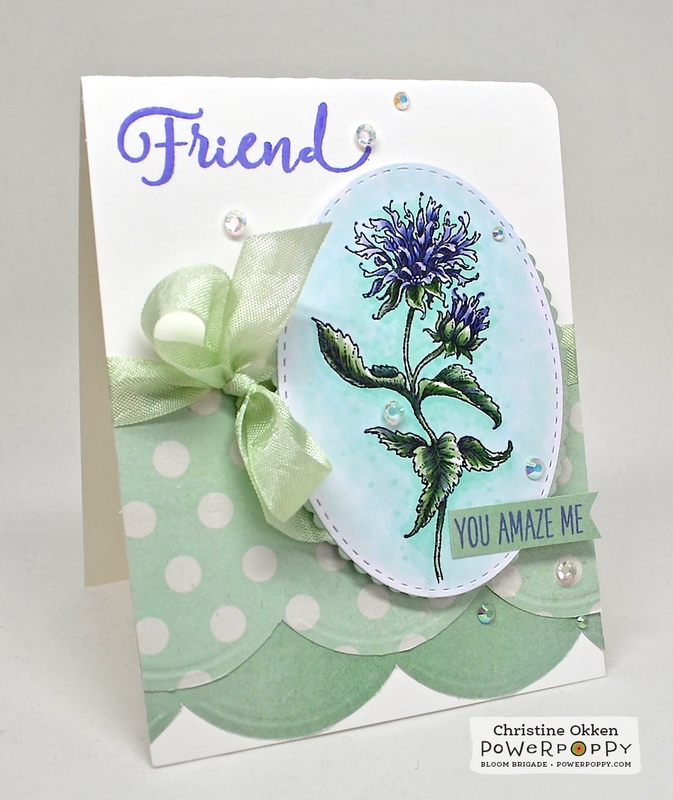 Gorgeous card design with the scallops and mint. Love!